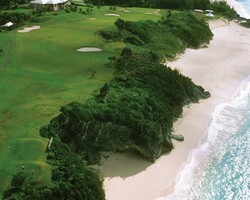 Looking for Package Deals to Bermuda Islands? We have those too! You've always wanted to go...take a look at Bermuda for mild year-round temperatures, blue skies, world-class golf, and pristine beaches. 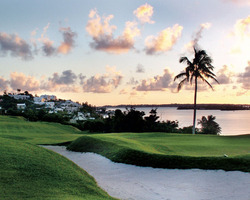 This is the way of the Bermuda Islands with our Fairmont Southampton Golf Around Getaway Package for the finest accommodations, challenging golf and value! Visit the beautiful Islands of Bermuda - from the historic and unique capital city of Hamilton, to turquoise waters ringed with pristine white sand, to world-class golf courses - Bermuda has something for everyone. 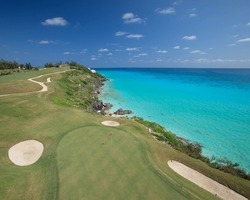 Enjoy the exquisite amenities and service provided by the Fairmont Bermuda Hotels, and play Port Royal Golf Club - home of the annual PGA Tour Grand Slam of Golf each October, Bermuda's premier private club -Tucker's Point, highly-rated Riddell's Bay or Belmont Hills Golf Club, and Turtle Hill Golf Course - a Golf Digest "Best Places to Play" choice. Make plans to get away and enjoy the recreation and relaxation of this unique island paradise. *Winter Season Special: January 3, 2019 - March 31, 2019 - for $352 per person/per day. Ask us about a non-golfer option when staying with a Golf Around Getaway Package Guest. Extra days and golf rounds can be added including Mid Ocean. Note: Packages do not include airfare. 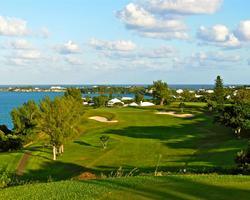 Fairmont Southampton Bermuda Golf Around Getaway Package from $277 per person, per day available 7 days per week! Contact a Bermuda Islands Vacation Specialist for first-hand knowledge of the area, package details and a customized trip itinerary! Looking for a different and affordable winter golf destination? Looking for perfect warm golf weather? Looking for great accommodations and spectacular golf?... Look no further! The Colors of Bermuda Golf Stay & Play Package features ocean-side accommodations, warm sunshine, blue skies, pink sand beaches, turquoise ocean, and beautiful green golf courses! This may be the time to finally take your trip to the scenic Islands of Bermuda. Make plans to get away and enjoy the recreation and relaxation of this unique island paradise. Package price based on two golfers sharing an Ocean View Room (king bed or two twin beds). Can upgrade to Ocean Front room for small surcharge. 3 night & 5 night+ accommodations are also available. Contact a Bermuda Islands Vacation Specialist for first-hand knowledge of Bermuda, plus package details or a customized trip itinerary! Imagine a paradise that looks like a shadow of heaven, and the sky. A sublime subtropical paradise located in the North Atlantic Ocean. An Islandscape comprised of numerous bridge-linked photographic islands, bursting in pink sand beaches, azure waters, and a mother nature-favored serenading wildlife. Geographically stunning from one end to another, decorated with lush hills and blooming vegetation. And imagine you are playing, swinging bravely, challenged by the unpredictable Atlantic winds in a paradise painted with the highest concentration of golf courses per square mile in the world, mostly overlooking the Atlantic Ocean. Now it's real, you are discovering the Bermuda Islands! Also known as Somers Isles, blessed with all kinds of wealth, and in addition to its wealth, the eight championship courses mostly perfected by architect Robert Trent Jones. Bermuda Islands has nothing more to ask for. Now, imagine no more... retreat from the busy world and play a round of a lifetime at the world's best layouts. To warm you up for Bermuda's longer courses, play Turtle Hill Golf Club at Southampton, and don't miss Port Royal Golf Club or Mid Ocean Club - two of the top courses in the world.